Picture Polish Glitch with layered clear jelly stamping. Picture Polish Glitch was a new shade released in early December. 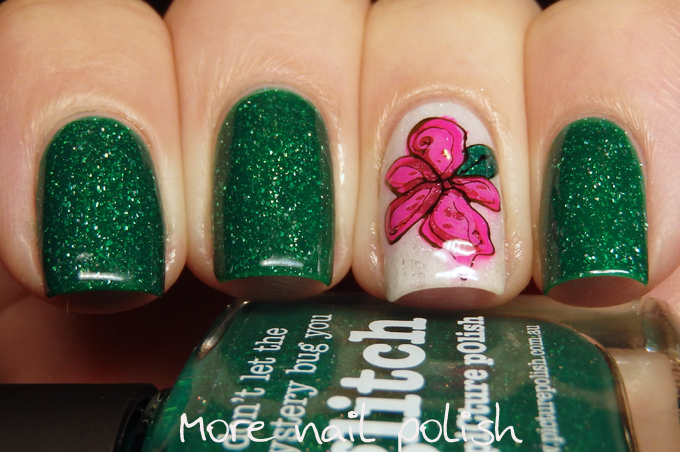 It's an emerald green scatter holo that was the perfect green for the Christmas season, but I tried hard not to create a Christmas design using it because I knew I wouldn't get around to posting it on my blog until 2016. I really need to do a comparison of the Picture Polish green scattered holos, because there are quite a few of them now. Back when I created Kryptonite, it was the first green they had, now there is Enchanting and Glitch in the scattered holos. 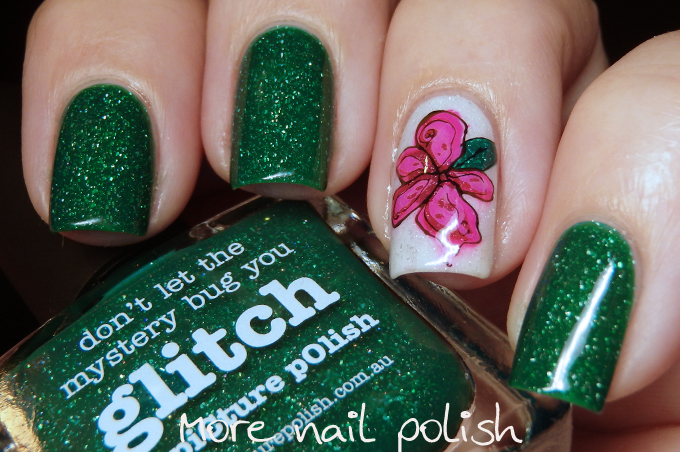 Glitch has a smooth formula and applies opaque in two coats. On my feature nail I started with a white base and then added a layer of Picture Polish LakoDom to give it the scattered holo appearance. I then created a decal on my Uber Chic mat using Clear Jelly Stamper Plate CJS01. This was the first layered stamping design I created as a decal. I found it really easy to pick up the petal parts and easy to place the petal parts on top of each other to create the layered effect, but I really struggled picking up the outline images. They are so finely etched that most of the time I only got partial pick ups. I then had to concentrate hard and use a steady hand to place the border onto the petals. It's an interesting effect, but I'm not sure I used the best colours for my layering. I definitely need some more practice with this technique. 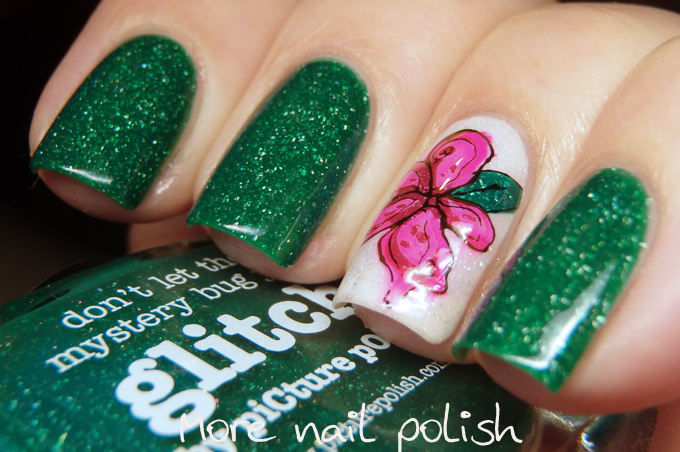 Picture Polish Glitch is available from Picture Polish. International ladies may be able purchase through one of the many Network stockists if they have this in stock. 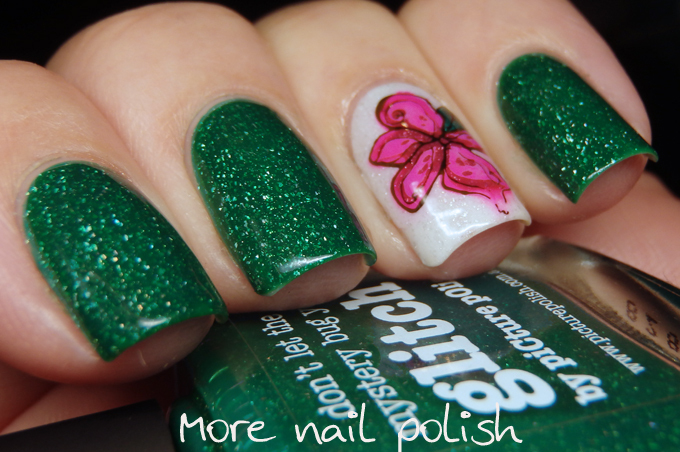 I love the green nail polish that you use ! The sparkles are beautiful, I really like it ! And the flower is really pretty too ! I just got a clear jelly stamper and am eager to give it a go. The layering you did here is great! Also, a huge yes, please! to a PP green holo comparison! What a nice green manicure! Like it a lot!